Authored by ngraham on Jan 6 2019, 5:09 AM. It's no longer necessary: The old method appears to have been an artifact of the days before wallpapers could differ from the aspect ratio of the screen without looking bad. This is no longer a technical constraint that we face. Simplicity: It's easier to manage wallpapers, add new ones, and edit existing ones if you only have to do it for one image, not 15 or more. Size savings: installed size on disk falls from 152 MB to 25 MB. There is no increase in memory use since Plasma automatically trims the image to the screen size before caching it in memory. All wallpapers are still installed and all still work and look good with the new "Scaled And Cropped" default setting. What happens if my wallpaper is set to the 1080p version of a wallpaper and then that version is removed with only the highest resolution version left? However, just removing files from the repo doesn't actually remove them from users' machines; their packaging system does that. Perhaps we should alert packagers that for the 5.15 release, they shouldn't remove these files from users' machines when they disappear from the repo. Should I accept now or should I wait until that gets sorted out? Feel free to accept, but I really want some input from a Plasma person on this whole idea before it lands. They have been silent on the matter so far but now that there are patches, I think it's important that we get the full story before going ahead. Maybe symlinking all to the largest version? What previous technical constraint are you referring to? And we've had the multiple resolutions since 4.x so it dates back a long way. CPU usage to load an image is a sizable amount of our loading. Especially for JPEG images. You might see that less in 5.x as it now happens in another thread, and we don't necessarily max out all the cores - but still. Our run-time resizes will look worse than gimp/inkscape doing it. See D18006#387372. In short, images were blurry when scaled and cropped. Aside from Plasma doing non-artist style cropping, they seem fine to me tbh. In your estimate, how bad would the added load be? +1 but we need to do some sort of a trade off here. IMO I'd keep all of sizes for "Next", but for T9817 and T10220 we're put in a pretty bad situation if having to ship all sizes because we'll be want to shipping large resolution wallpapers and quite a few of them. For instance, just shipping a certain old Plasma wallpaper adds 20 MiB to the plasma-wallpapers package, which is already almost half of its current size (a bit over 40 MiB). For comparison's sake Deepin, GNOME and Elementary also just offer one size in this extra package from what I can tell. 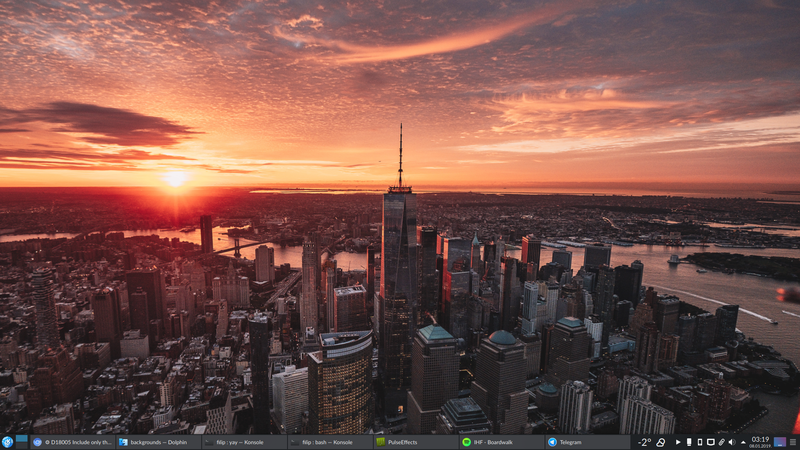 Also might be worth mentioning that the new photographic wallpapers in T10220 are CC0 or similar licence (Unsplash) and picked from third-party sites so there's no author involvement with KDE. We're also trying to select them based on whether or not they will get messed up with cropping. In short, images were blurry when scaled and cropped. I want the "In long" version. QImage resizing hasn't changed, and with the source size set that's what we'll be using. What I can say is that this Kubuntu experience wasn't a one off, I had to crop my wallpapers manually for the longest because Plasma would make them blurry if they didn't match the screen resolution. However, it's been working lately. I know this isn't the greatest info, could you help me investigate what actually changed in the meantime? I can test whatever's relevant. I can list bugs that you might have seen in 5.x. I can't name things in 4.x. which is when it was introduced. Its before my plasma time. @filipf That looks about right! Also what exactly do you mean by "run-time resizes"? Where would these happen? It's not. That's only within 5.x. Effectively it's a resize before the texture upload, rather than being done in the shader every frame. Only the resized version will be in memory, but it will be the uncropped version which is why you sometimes still see a tiny increase. 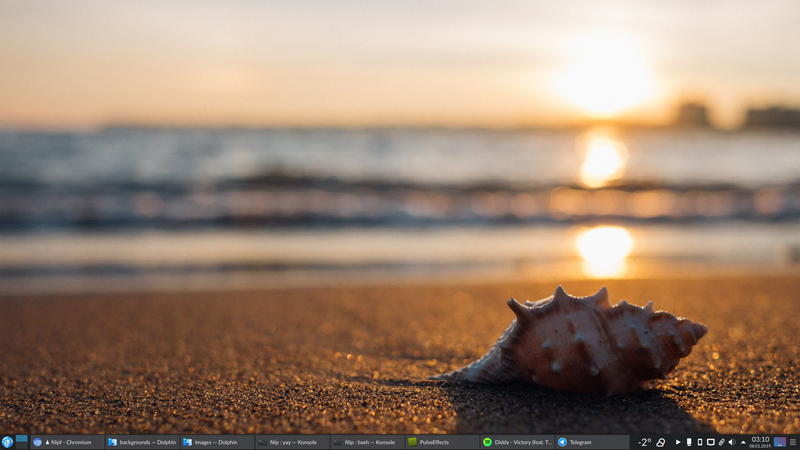 I've booted up Debian 8, KDE SC version 4.14.2. The wallpapers scaled nicely there so I understand your curiosity. This leads me to speculate that cropping was done mainly due to artistic reasons. The wallpaper chooser explicitly lists resolutions so this may hint at some problems before 4.14, but that's before my time as well. Leaving orphaned files on disk isn't really acceptable. Instead Plasma should perhaps recognise that the image has gone, and seek and apply whatever single larger size now exists. Perhaps we should alert packagers that for the 5.15 release, they shouldn't remove these files from users' machines when they disappear from the repo. Why does it result in a black screen? If we are storing the image by path rather than package ID it kinda makes the whole system a joke. Letting Plasma scale this 3972x2979 wallpaper. This is Plasma using the same wallpaper cropped in GIMP to 1920x1080 monitor resolution. There is almost zero difference. But it's neglible IRL (when not comparing), I guarantee there will be no one telling us the wallpapers are blurry. Which would be sad, yeah. We'll need to fix this. Any idea where I should look? FWIW I agree that the image editor scaling vs Plasma scaling is a non-issue. Even in the worst-case scenario, the only distinguishable differences are when you deliberately do a flip-between-them comparison. For most, the differences are negligible and non-regressive. No one is going to notice or care. It's a total non-issue. @rooty and I have been shifting through loads of wallpapers in the past month or so and it hasn't even occurred to us that this (image editor vs. Plasma cropping) might even be a thing. The difference is minor and not noticeable. We also never noticed any performance issues, although people with greater expertise should expand on that. As for packaging, my only concern (applies to D18078 as well) is if someone was using an old wallpaper (whichever the resolution was). This 1 image should ideally be retained somehow. So it sounds like our only technical blocker is that we don't want people who are using a wallpaper whose small sizes disappear on disk to get an ugly black background. @davidedmundson or @mart, any ideas on this front? Could Plasma always copy the used wallpaper to some location and link to that? This is actually an annoyance irrespective of this discussion, if you move your wallpaper on the disk you lose the wallpaper. any ideas on this front? Apparently we do store by full path which is quite a good argument for us stopping doing this thing. Does @cfeck's idea to turn the smaller sizes into symlinks make sense as a transitional step to preserve the user experience for people who are current users of these wallpapers? Could Plasma always copy the used wallpaper to some location and link to that? If we're going to save it, we could save the post-scaled version which would nullify the increased loading cost argument...and it would be a prerequisite for having a single wallpaper across screens which is also requested. This sounds like a great feature, but would it be necessary if we make symlinks in the 5.15 timeframe? This is no longer a technical constraint that we face. I don't think this was ever a thing. Ok, lets do it with the symlink thing. For D18078 it would be best to wait until a save cache is implemented, right? I believe so. Once we have that, we can remove these compatibility symlinks too.